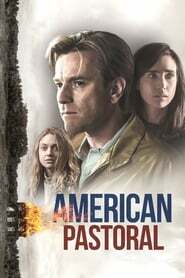 Based on a novel of same name, American Pastoral is a crime drama film. It takes a lot of courage to make an adaption of Philip Roth’s novel and Ewan McGregor did a fine job of directing this movie. The movie begins with narration of Nathan Zuckerman, a writer in his 60s, visiting some high school reunion for the sake of killing time. At the reunion, Nathan meets some of his old friends including Jerry Levov. The brief meeting brings up the name of Jerry’s brother Seymour Levov, who was popular as Swede, and Nathan learns about his death. The news of his death brings back all the memories. Swede was a true high school hero in all means. He was an athlete from the Jewish family, who actually “fit in” with everyone and also “stood out” against others. He was just perfect sign of optimism of the post-war. The entire story of Swede is in the flashback. The flashbacks shows Swede persuading his dad, Lou Levov, a glovemaking magnate, to allow him to marry the love of his life, Dawn Dwyer, his high school sweetheart. Lou has his religious doubts since they are a true Jewish family while Dawn belongs to a catholic family. However, looking at his son’s love for the girl, Lou finally decides to give in. together Swede and Dawn has a daughter named Meredith and they settle down in Old Rimrock, running a large farm. There have been mix reviews regarding Ewan McGregor for the role of Swede. Some people find him not the best choice for this role. However, there definitely some moments in the film where he has given mind blowing performance. Some of his best scenes are with Hannah Nordberg, who plays the role of his 11 year daughter Merry (Meredith). The plot of the movie goes on with the struggle of Merry trying to blend in with the rest of the world while battling with her stuttering problem. Merry’s character is found to be radicalized as war of Vietnam rages. She starts taking part in protests taking place in New York. Worried about her daughter’s condition, Swede forces her to use her energy of protesting against war while staying at home. However, things change when the post office as well as gas station of the town is blown up using a massive bombs, ending up with killing the owner of the gas station. Soon after this incident, disappearance of Merry takes place and now she is the prime suspect in this bombing incident. There are certain scenes in this movie that seems to be drag and boring to the viewers. However, one cannot deny the fact that it is not an easy thing to make a movie based on the Philip Roth’s novel. Ewan McGregor has shown some amazing directing and acting skills in this movie. One cannot say that the movie lives up to the standards of the novel. However, it is still a fair attempt made by the entire team of the movie.